Setup all the details (title, description, keywords, etc) in advance, even if you'll be doing other live streams between now and the time of your event. 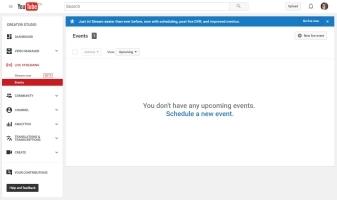 Share the event's unique URL with your subscribers across a number of channels, even days or weeks before the event. 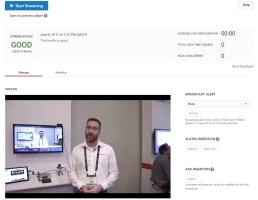 Preview your live stream before you go live. 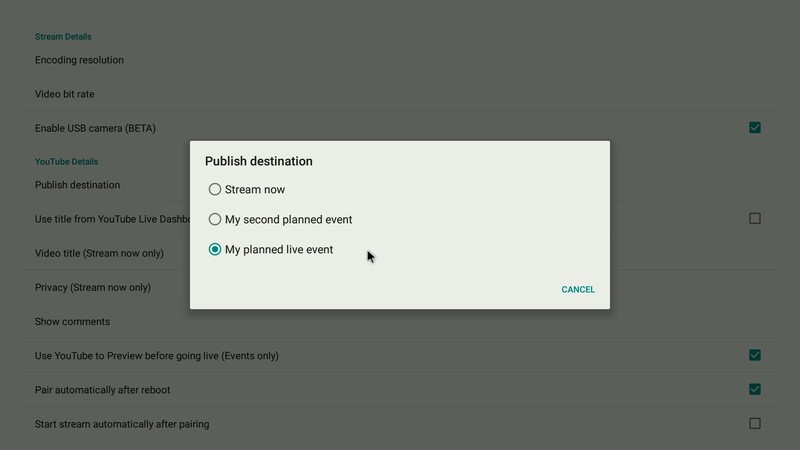 For a complete list of the differences between streaming to a Live event vs Stream now, see Set publish destination. 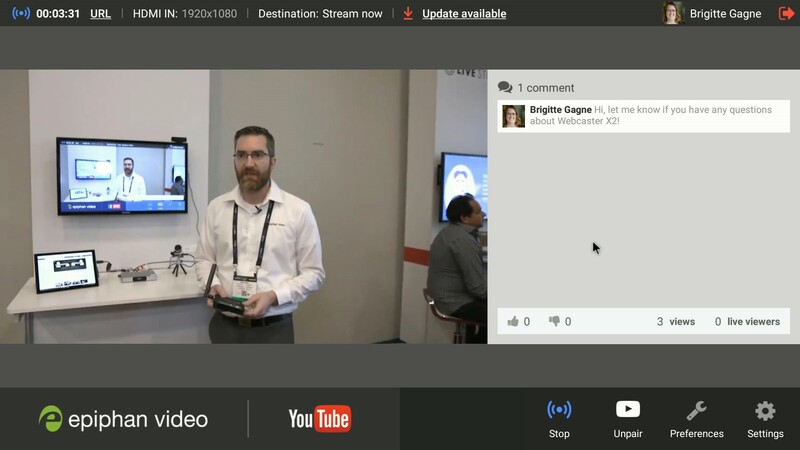 It's easy to use Webcaster X2 to live stream to an existing YouTube Live Event. An Internet connection with a minimum of 6 Mb/s uplink for 1080p, or 3 Mb/s for 720p . Each Webcaster X2 you connect to your network needs a constant uplink bandwidth of 3 Mb/s to 6 Mb/s by default. Any popular internet speed test can help you determine the peak bandwidth you have available. We recommend allowing for at least 1.5 times the amount of bandwidth you expect to need for your live stream because other devices, including personal computers and voice over IP phone systems, can use a significant portion of your available uplink. This example shows you how to stream an HDMI camera, but you can use any other HDMI source you like (camera, computer, video mixer, etc. ), as long as your source (or media) sends video at 720p or 1080p and does not have High-bandwidth Digital Content Protection (HDCP), and sends audio at 44.1 kHz or 48 kHz. Connect everything and turn on Webcaster X2. Connect your HDMI camera to the HDMI IN port. Connect your display to the HDMI OUT port. Connect your mouse to one of the USB ports. (Optional) Connect your keyboard to another USB port. Turn on Webcaster X2 by plugging in the power cord; Webcaster X2 executes its boot-up sequence. 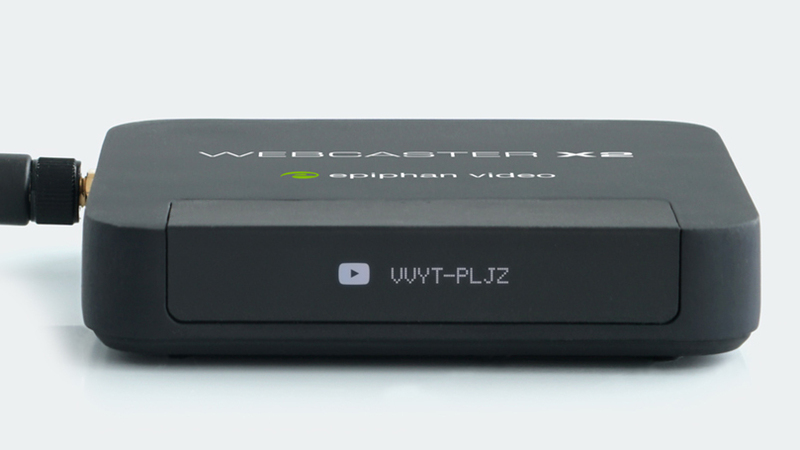 Webcaster X2 supports HDMI input signals of 720p (1280×720) and 1080p (1920×1080), progressive signals only. Interlaced signals (e.g. 720i and 1080i) are not supported. If your camera isn’t supported (or is experiencing another signal issue), the front screen and attached display show a message that says HDMI IN No Signal. Audio is supported over HDMI at 44.1 kHz and 48 kHz. Or using the (beta) USB camera feature, you can use the audio from a connected USB webcam or a plug-and-play USB microphone that is a UAC device. If the YouTube logo isn't visible on Webcaster X2's front display, double-press the multi-function power button. See Choose the platform app you want. If you have not already created your YouTube Live Event, create it now on YouTube. Open a browser window on your computer, tablet or mobile device. Go to the YouTube live events page www.youtube.com/my_live_events. 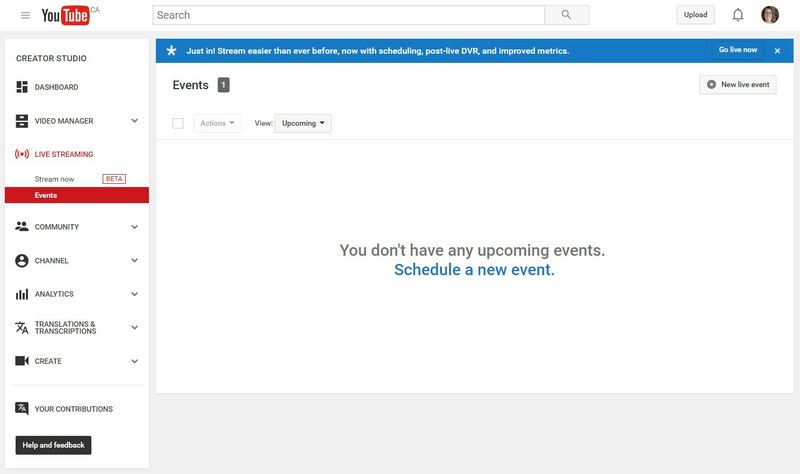 Click Schedule a new event. Enter a date, time, name and description for your event. Select your event privacy and Click Create event. No need to configure anything else! Your Live Event is ready. If Webcaster X2 is not already paired with your YouTube (Google) account, pair it. 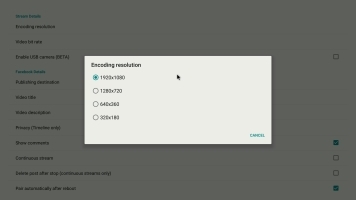 Look at the front screen display for your YouTube device pairing code or click the Pair icon if you're using an attached HDMI display. 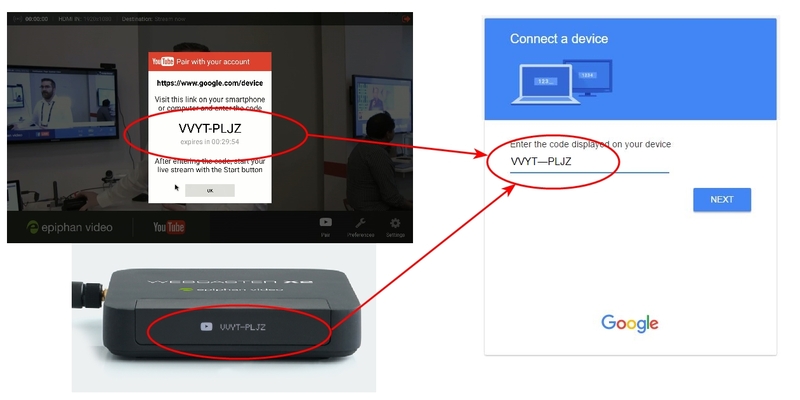 If your Webcaster X2 is paired with your Google account from a previous session, your account name displays instead of a new pairing code. If no code appears, check that you still have an Internet connection or whether you are still logged in to a captive WiFi network, see Use a captive WiFi network that's password protected . Using a web browser on your computer or mobile device, go to google.com/device and login to your Google account. If you manage more than one YouTube channel, pick the channel you want to stream to. It's important that you pick a channel that's verified and able to stream to YouTube. Check your channel's access to live streaming using this YouTube link. 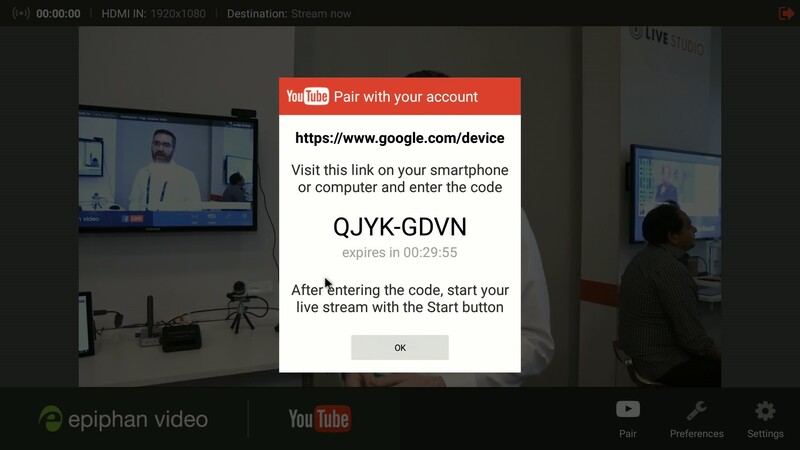 On the Google device pairing page, enter the pairing code from your Webcaster X2 in the device code field, then click Next and Allow to authorize Webcaster X2 to live stream to your YouTube channe. The front screen on Webcaster X2 updates to indicate that it's paired with your YouTube account. To unpair the encoder, click the YouTube Unpair icon from the bottom of the screen. Configure your live stream settings. Click the Preferences icon at the lower right corner of the screen; the preferences screen opens. 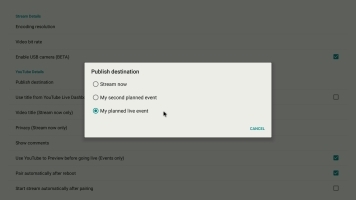 Click Publish destination in the YouTube details section; Webcaster X2 asks YouTube for a list of your events and displays these (along with Stream Now) in the Publish destinations settings box. Select the Event you want to stream to. 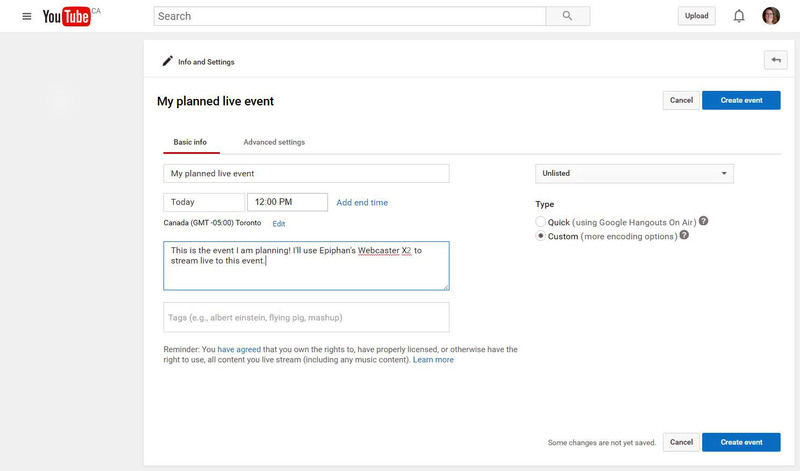 To Preview your stream on YouTube before your event starts, check the Use YouTube to Preview before going live checkbox. If this is unchecked, your stream will go live without a preview stage. What does show comments do? You can use Webcaster X2 to monitor YouTube video comments on your attached HDMI display. At the top of the screen, viewers comments are displayed with most recent at the bottom. Below the comments you can see thumbs up and thumbs down count, as well as a count of total views and live viewers. If not already on the Preferences page, click the Preferences icon at the lower right corner of the screen; the preferences screen opens. Check or uncheck the Show comments checkbox in the YouTube Details section. When your stream starts, you will see a live viewer count and comments on the chosen side of the screen. 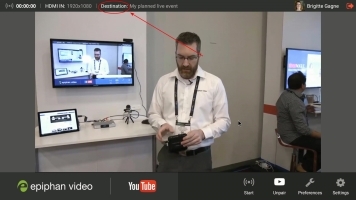 During your live stream, click the left mouse button of your mouse connected to Webcaster X2 to show or hide the Webcaster X2 overlay (including comments, if you have your device configured to show them). Right click to exit the Preferences. 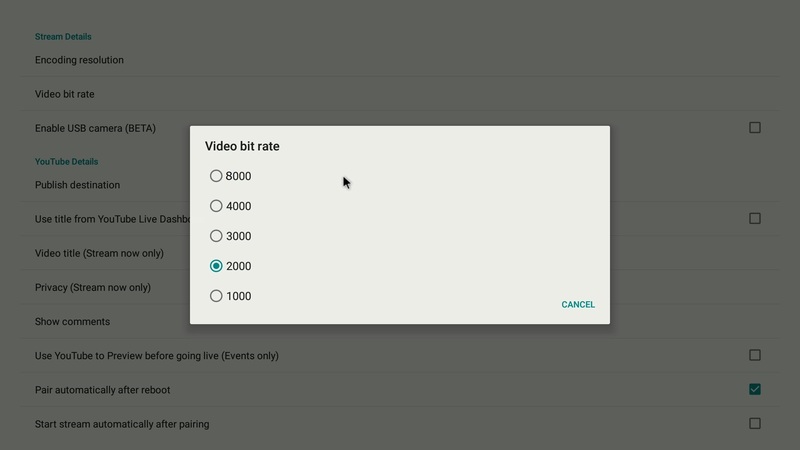 (Optional) Configure your stream settings, being sure to match the bit rate and resolution you configured for your YouTube Live Event. The resolution is the size of each frame and is sometimes called frame size. Usually these values are expressed as a pair of values such as 1280×720. The first value describes how wide your picture is (in pixels) and the second how tall it is. Some resolutions also have short forms. For instance 720p or HD means 1280×720. 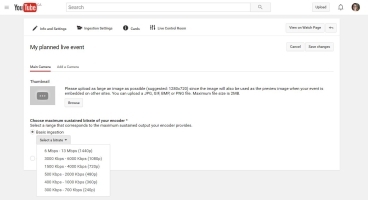 The higher (larger) the resolution, the more data needed to accurately describe everything in your video. If you have limited uplink bandwidth, you may need to stream at a lower frame size. Facebook has specifications for the maximum resolution they accept. Currently this value is 1280×720 (720p). You can configure the resolution that Webcaster X2 sends to YouTube, Facebook, or Twitch. Note: You cannot change the resolution during your live broadcast. If you change it while streaming, the change only takes effect when you stop the current stream and start another. If not already on the Preferences page, click the Preferences icon at the lower right corner of the screen. The preferences screen opens. Click Encoding resolution in the Stream Details section. Note: When you first get your Webcaster X2, the default resolution is 1280×720. If you change the settings, Webcaster X2 remembers those changes the next time you use the encoder. Right click to exit the Preferences menu. What is video bit rate? The bit rate is a measure of how many bits of data are sent each second and is often referred to as kilobits per second and abbreviated kbps. 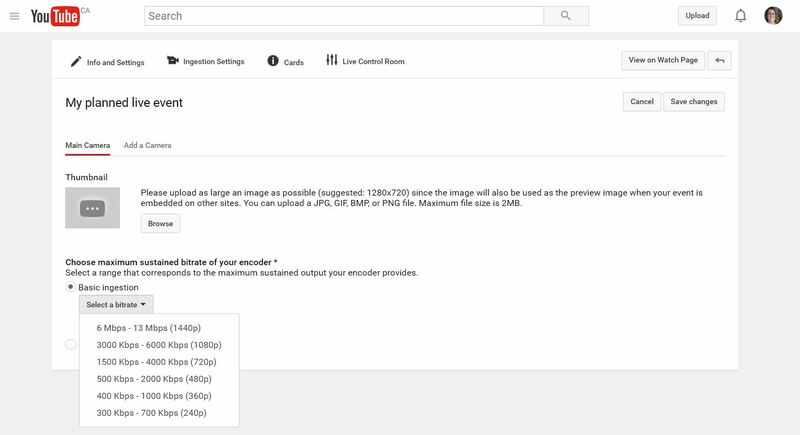 The higher the bit rate, the more data per frame, and therefore the more detail you'll see in your video. Higher bit rates send more data over your uplink, so sometimes having a low bit rate is necessary to avoid overloading your Internet connection. Facebook has specifications for the maximum frame rate they accept. Currently this value is 4000 kbps. You can configure the bit rate that Webcaster X2 sends to your streaming platform. By default, Webcaster X2 streams using 2000 kbps. Note: You cannot change the bit rate during your broadcast. If you change it while streaming, the change only takes effect when you stop the current stream and start another. Click the Preferences icon at the lower right corner of the screen. The preferences screen opens. Click Video bit rate (kbps) in the Stream Details section. Note: When you first get your Webcaster X2, the default bit rate is 2000 kbps. If you change the settings, Webcaster X2 remembers those changes the next time you use the encoder. Click the Right mouse button to return to the main screen. Your streaming destination is listed in the top bar of the main screen. When you are ready to start streaming, click the Start icon , press the multi-function power button, or press Space on a connected keyboard. 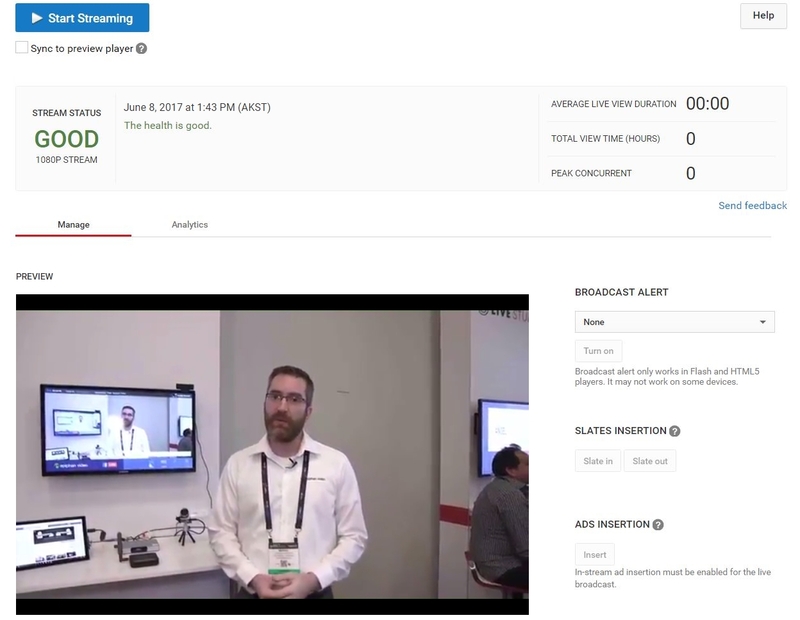 After a few moments (where Webcaster X2 is communicating with your YouTube account), your stream appears in the event's YouTube Live Control Room. IMPORTANT: If you checked the Use YouTube to Preview before going live checkbox in earlier configuration steps, the stream doesn't automatically go live until you take further action from your YouTube Live Control Room. Return to your YouTube browser window and go to the Live Control Room for your event (the link can be found from the YouTube My Live Events page). Notice the stream status is GOOD if YouTube is successfully receiving the video stream from your Webcaster X2. If it is not GOOD, verify your Webcaster X2's Internet connection. Click the Preview button; YouTube ingests the video sent from your Webcaster X2 and lets you preview it with the Live Control Room preview window. 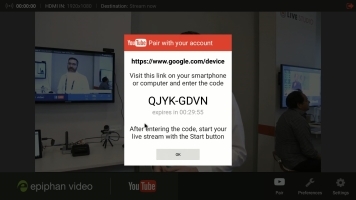 When you are ready, click Start streaming, YouTube starts your live event. At the same time, your Webcaster X2 updates the info bar to indicated you are now live. During your broadcast, click the left mouse button to show or hide the Webcaster X2 overlay (including comments, if you have your device configured to show them). 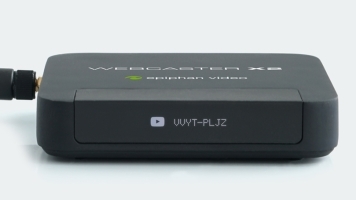 Webcaster X2 stops transmitting to YouTube. 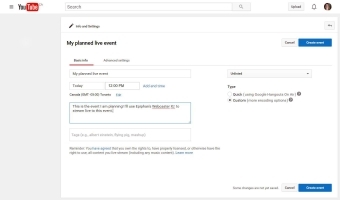 Now that your YouTube Live Event is complete, you can no longer stream to it. Webcaster X2 updates its publish destination to Stream Now. You can also use Webcaster X2 in pre-configured mode with manual or automatic start. ™ and © 2019 Epiphan Systems Inc.